I am in Nicaragua this week working on an early literacy project. Whenever I’m here, things are a little quieter on Spanish Playground. 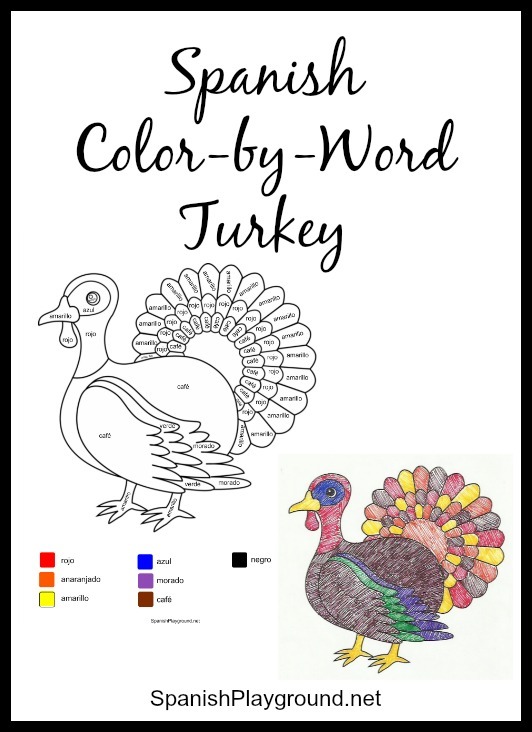 Thanksgiving is coming soon though, so I wanted to share this printable color-by-word turkey. It is a good way to learn or review Spanish colors. There are two versions of this turkey. They have the same color words, but one of them is easier to color. On both versions, there is a key for the colors at the bottom of the drawing. Doing this activity, kids read the words for colors over and over. If they use markers, the darker colors cover the word completely. That’s good because they have to read it again. You can also make the coloring sheet into a craft by gluing colored pasta or colored seeds onto the paper. If kids enjoy this activity, they can also make their own color-by-word pages. There are many printable coloring sheets online. Kids write in the colors. Then copy the picture so that they can exchange with a friend or classmate. Perfecto. Puedo usar las dos versiones en mis clases de español. Muchísimas gracias.